Microbiologist Dr Anand says -Composting is a microbial process by the activity of microorganisms. This article clearly notes important scientifically proven factors to bear in mind during composting in order to obtain a digested compost full of Nutrients. It has been proved beyond doubt that continuous use of fertilizer in coffee makes the soil sick and this can result in a significant fall in the production levels. A new way of looking at this problem is by employing split applications of fertilizer coupled with large quantities of compost to give economic returns without damaging the soil and environment. 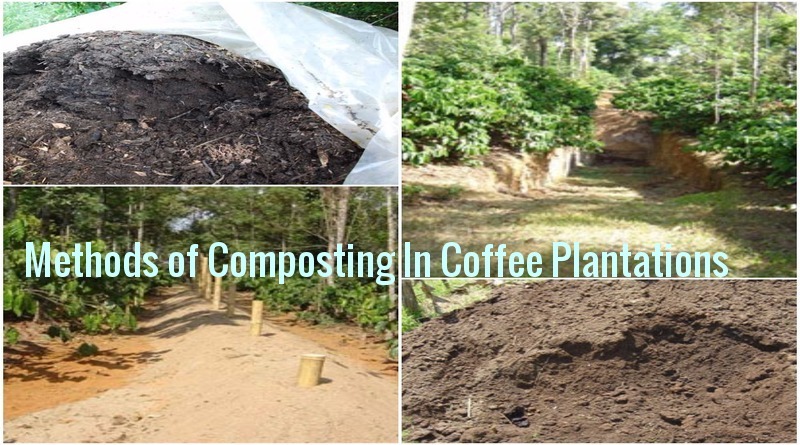 Supplementing chemical fertilizers with farm yard manure (FYM) or compost within the coffee plantation has been an age old practice. It is very important to understand the complexities and diversities involved in composting, because the art of composting is purely based on scientific facts and a thorough knowledge of soil microbiology. Composting can be defined as a microbial process in which organic wastes are converted into humus by the activity of microorganisms. Every coffee farmer is the owner of a small herd of cattle, primarily for the purpose of preparing FYM or compost. Generally the cattle urine and dung are lead into a pit which is mixed with greens and refuse straw from the cattle shed and made into heaps. The pit where the FYM is prepared is generally ten feet long, six feet deep and six feet wide. The heap is turned every three months and in about a years time digested FYM is available with 0.5% N, 0.2% P and 0.5% K. Even though this is not a very scientific method, it is followed by the majority of the small coffee farmers. Nutrients in FYM are not readily available to crop plants. Very little amounts of nitrogen are readily available but more than 70% of P and K are readily available. Most coffee farms are known for the availability of tons of organic raw material needed for preparation of compost. Poultry litter, sheep droppings, piggery waste, cattle dung. Any of the above mentioned products (singly or in combination) are added to fresh leaf litter, weeds, succulent stems, coir pith, press mud, coffee husk in layers. At times Trichoderma and Mycorrhizae are inoculated to the mixture of organic residues so as to hasten the process of decomposition. The entire process of composting is either done by the Pit or the Heap method. Experiments held in Joe’s Sustainable Farm ,Kirehalli have proved that long pits almost 50 to 75 feet long with a gradual depression on both ends are desired such that the tractor or lorry bringing in the organic wastes can get inside the pit and unload the waste right in the centre of the pit. The tractor comes in the opposite direction bringing in coffee husk and the lorry gets into the pit at the other end with poultry or cattle manure and without any wastage of labor the two components of organic material are mixed inside the pit itself. This method saves costly labor. We have experimented with 6 different sized pits ranging from 100 feet long, 8 feet wide and 10 feet deep to smaller pits of 50 feet long with the other dimensions being the same. The bottom of the pits is generally sprinkled with a handful of urea so as to accelerate the microbial activity and reduce nitrogen immobilization. So We add a little bit of phosphorus, rock phosphate and potassium to the pit because these two major elements (phosphorus and potassium) are required during the process of composting.Phosphorus is involved in the energy transfer of microbial cells and potassium in regulation of osmotic pressure of cells.We follow a special rule where in the organic matter deposited in the cradle pits or trenches inside the coffee estate is harvested and sprinkled on to the organic wastes. Actually this is a key step in the preparation of the Scientific Compost method in Kirehalli farm. Another interesting method follow is the vertical insertion of long bamboo poles inside the pit at intervals of 5 to 8 feet. (b) to add water in case the moisture level declines beyond the threshold level. The organic matter inside the cradle pits has millions of beneficial nitrogen fixers, solubilisers both symbiotic and free-living and is compatible and well established into the local ecological niche. When these bacteria, fungi, actinomycetes, and invertebrates such as nematodes, earthworms, mites, protozoa, and various other microorganisms like beetles, snails, slugs, roundworms, flatworms get into the compost pit, they activate and accelerate the rate of decomposition at the right phase. We refer to this precious inoculum as Mother Culture and it has proved beyond doubt that this inoculum results in well digested compost. As the various farm wastes were stacked up in layers, occasional sprinkling of water was carried out. One must bear in mind that moisture status of the compost pit is a critical factor in determining the end product.Microorganisms require a high amount of moisture to carry out decomposition but cannot tolerate waterlogged conditions. The proper water content of compost is about 60 to 70 percent damp. If excess water is present it destroys the aerobic micro flora. Another important criterion is the adjustment of hydrogen ion concentration to a scale of six to seven.Since decomposition is associated with the production of organic acids the pH needs to be increased to neutral range by the addition of lime/ eggshells/ bone meal or wood ash. The top most layer of the pit was plastered with a mixture of clay and dung. Once every three months the mixture is turned inside out to provide aerobic decomposition.In about a year’s time, black colored compost which is fully digested is available to be broadcasted to the estate. Black colored compost which is fully digested is available to be broadcasted to the estate. It’s important to note that we wait for one full year before the compost is broadcasted inside the plantation,simply because it takes that much time for the equilibrium in the compost pit to set in. We have observed by way of experimentation that the entire Kirehalli composting process undergoes six phases before the raw material is converted into energy rich nutrients. Phase 2 Temperature build up inside the compost pit. Phase 3 Breakdown of lignin, cellulose, hemi cellulose. Phase 4 Temperature reduction phase. Phase 5 Mineralization of organic wastes.